Things still look quite ragged here but the new growth is quickly filling in and I just planted more herbs from seed this weekend. It’s amazing how quickly things grow – the chives are noticably larger now and the weeds are certainly romping ahead! I love the kitty photos, they are really special! Is the topiary a bay plant? It’s awesome! It’s a bay tree and I’m so pleased it’s survived Winter. I had it all wrapped up in hessian which got blown off in the wind… I’ve given it a bit of a haircut and it looks surprisingly healthy. It’s beautiful! I’m wondering if one would survive here. It seems like our climate is pretty similar to yours. Love the fairy garden and that topiary! Thanks… the fairy garden is a work in progress. I want to put it outside but I need to make a weather proof house first! All looks ready for a wonderful summer. You’re the second gardener that I’m seeing growing potatoes in a tube, is that a new trendy thing? I can’t wait to see how they turn out and you’re probably right about covering it, LOL Bella and Milo are so darn cute 😀 It might take me extra long to do half as much since I’d want to snuggle them up nonstop. What’s up with cats and dirt? Alys’s adopted kitty Mighty Mouse looked positively dusty the other day. Hi Boomdee x I’m using the tub so that I don’t have potatoes popping up forever more in the raised beds! The cats are really snuggly but hopeless gardeners… I have paw prints, holes and soil everywhere now! Those two are so darn cute! I’m loving your fairy garden. Mine is currently in rehab thanks to the mischievous Mighty Mouse. More on that later. Meanwhile, watch this kitty drink from the faucet, then dry his face. Hilarious! That is so cute. My cats LOVE water and happily stick their faces, paws and ears under the running tap. In fact, they actually sit in the sink in the utility room waiting for me to run the water. Oh how sweet! I hope you capture photos or video of those two having a shower. Sweetness! Mighty Mouse is a character. We all love him to pieces. The kitties in the herb garden are sweet! 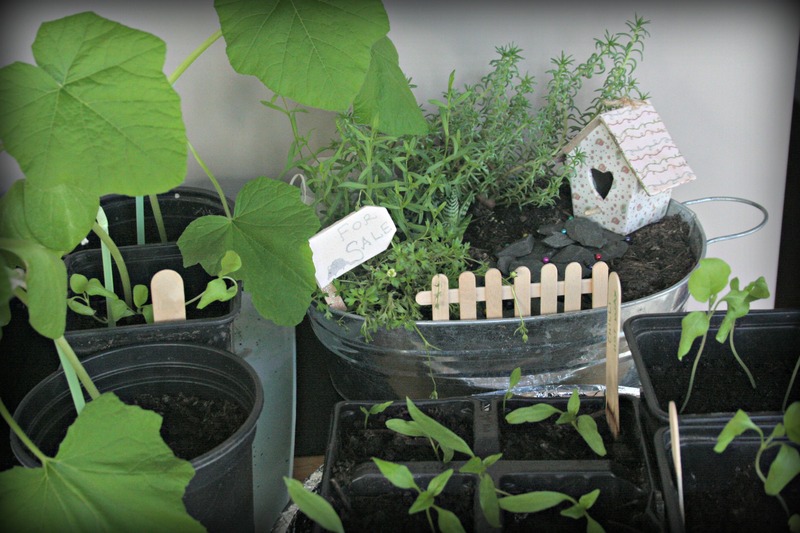 My herbs are getting going now as well – the mint is sprouting and the sage is getting new growth. My sage looks dead but I darent remove it as it never looks the healthiest plant even though it smells and tastes gorgeous. I have had to replace some herbs this year as they are getting rather woody. Lemon Thyme is my favourite. It is good to see fresh green growth in the garden, at long last. Your kittens are looking much more grown up now aren’t they. Beautiful and sleek. They look like adult cats now but still act like kittens. They’re nearly 8 months old but it feels like we’ve known them forever. I took inspiration from your post Elaine and cut myself some daffodils to bring indoors – they look and smell lovely! Ragged herb gardens are obviously the height of fashion this spring. At least yours is showing signs of life, apart from the indestructible chives and mint, mine is just a collection of dead twigs! C’est la vie! If dandelions and brambles become the height of fashion then I’ll be on the cover of Horticultural Vogue! As always the cats are adorable. 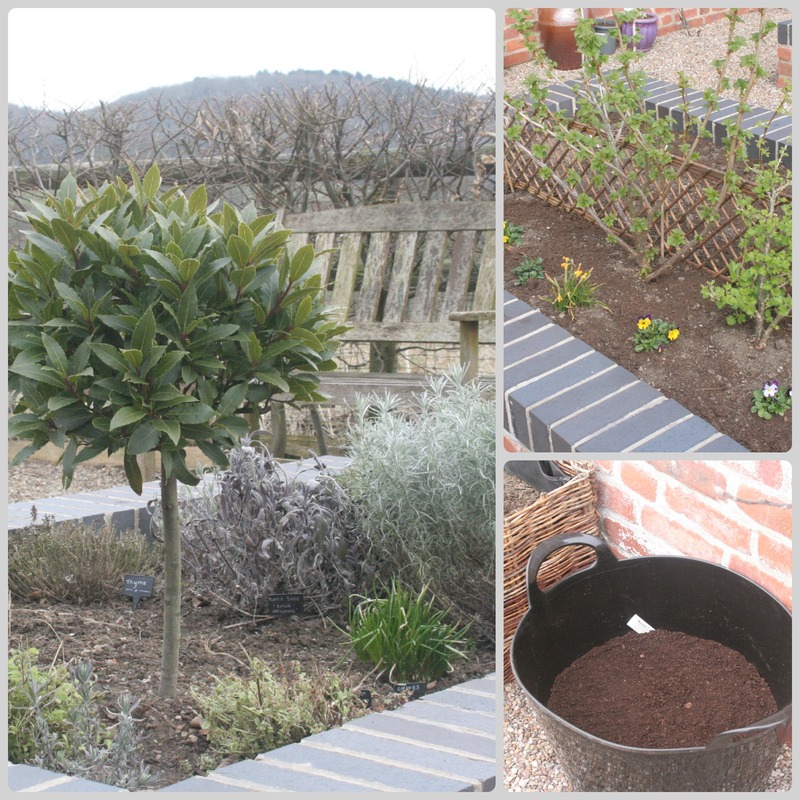 The bay leaf tree (I think) looks great! Like your two cats, I like to mill in and about the herbs- though in my case it is to pull weeds. I love the way the fragrance of the herbs can cling to your hands. The herb border is my favourite (just don’t tell the vegetable beds!). The smell of herbs are lovely and worth growing for that alone! My cat is a little monkey – her sweet looks cover her mischievous nature well. Your herb garden doesn’t look so bad considering the rubbish weather the plants have had to deal with – so far the spring has been a long way from the Mediterranean ideal! Your kitties always make me smile! I enjoyed the video Born to Organize posted, too. You could put chicken wire or any kind of small-hole wire over your potato bucket to keep the cats out. I’m trying to grow potatoes that way, too, this year. I like your espaliered Currants/Gooseberry. 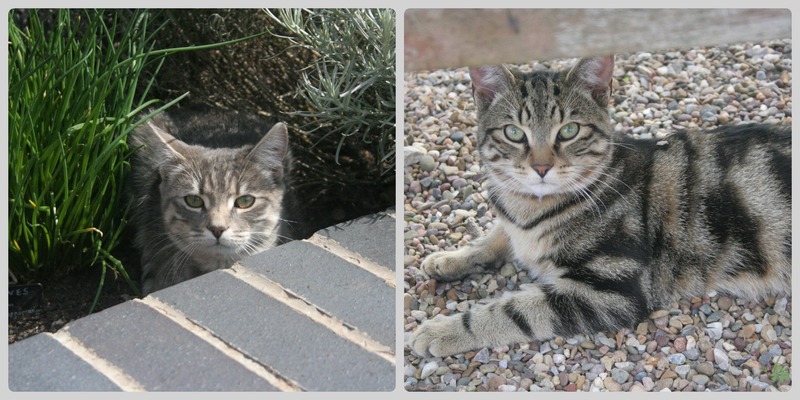 Your very cute cat looks very much like our cat, Tiger – who is equally eager to jump over my seedlings with his brother, Mog. Do you have any nepeta/catmint? I love it and the cats are at the moment too – it’s a good distraction from other things! And your herbs look as if they’re doing really well. Oh yes, my three cats have a habit of rolling around in the plants too. I always have to cover seedlings and any patch of bare earth to make sure they don’t use it as a litter tray. One of my poor strawberry beds got the ‘treatment’ last year! Catmint is fabulous though. I grow it in a pot by the back door and they go absolutely mad for it!